It’s nearly a year now since we were in Madrid, and while during that time we’ve managed to shed some of the excess poundage we gained there, we’ve lost none of our longing to be back there. And, it’s a strange thing about longing that all your memories become more vivid, and you remember even the smallest details. So, on Sunday morning, we sought to recreate what, while in Madrid, seemed like a comparatively minor facet of our stay – breakfast. In Spain, as in other parts of southern Europe, a typical breakfast is characterized by three things: sugar, caffeine and nicotine, but it would unfair to suggest there is no greater variety than the, admittedly delicious, combo of pastries, coffee and strong cigarettes. Roommate Mario (our hotel, not an actual person), in the Opera district of the city (not far from the magnificent Palacio Real – see above), was a small, boutiquey-type place and not, by any means, the type of hotel we’d commonly stay in. And, apart from the unusually reasonably-priced room, what convinced us to pick this hotel was its renowned “free” breakfast. Research suggested that not only was it sumptious and delicious, but that it was served until noon, which, given that we like to sleep on vacation and would be eating and drinking later than normal to fit in with the insomniacal Madrileño lifestyle, was another bonus. I’ve always found it despicable and somehow mean that most hotels only serve breakfast until 10am, so that people who actually on vacation nearly always miss it. Our typical breakfast at Roommate Mario was, of course, a tongue-tinglingly powerful cup of café solo or “capuchino”, a tiny glass of freshly-squeezed and enjoyably sour orange juice, and several triangles of the most perfect tortilla española layered on fresh, crusty bread with slices of manchego and lomo – cured loin of pork delicately flavored with pimenton – and topped with a drizzle of golden Andalucian olive oil and, our new favorite condiment, grated tomato. I know it doesn’t sound like a wildly exotic or even a very exciting breakfast (especially to our Spanish readers), but to us, who usually only shove down a slice of toast before hurrying out of the door of an average morning, it was out of this world. So, this past weekend, as you can see from the pictures, in a flood of nostalgia, and flush with many of the requisite ingredients, we recreated our Madrid breakfasts in our Brooklyn apartment – courtesy of a very kind deli counter worker at Union Market (69cents for six slices of jamon iberico!) and through the good graces of our friend Nuría Farregut at Spanish Recipes and the miracle of vacuum-packing. In fact, so thoughtful and kind is Nuría that yesterday, just as we were mourning the last of the chorizo de bellota she sent us from La Boquería over the summer, another package arrived with some magnificent-looking dry salami/salchichon! It’s as if we managed to telepathically transmit our longing for Spain to Nuría in Barcelona. I mean, we’re still desperate to return, but at least our stomachs are temporarily satisfied! Thank you so, so much, Nuría! Una amiga en jamón, es una amiga por la vida! 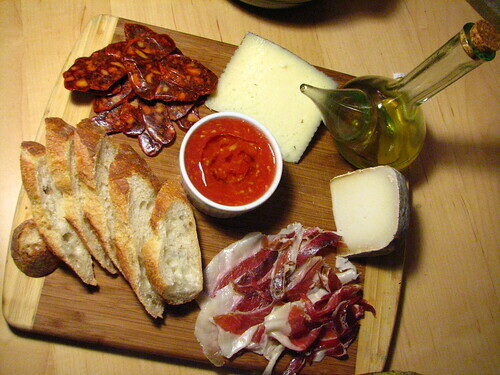 I could eat the Iberian ham, the Manchego and chorizo for any meal of the day. Have a great holiday, guys. Came from Joe’s 7 fishes feast to here, and it’s official. I’m *starving*! Yum! I could totally get behind this. This looks like what I used to eat for dinner almost every night when I was a chain-smoking, vodka-swilling single girl living the “European” lifestyle. I stayed very thin on that diet, ironically. btw, thank you for my mulling spices! I replied to your first email, but maybe you didn’t get it? Check your spam box. lucky dawgs you for eating all that jamon y salchicha! Miss Spain like crazy. do you guys eat churros’s there? 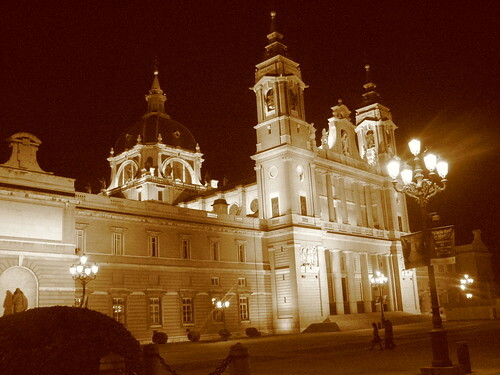 …now I’m longing for Madrid and I was there less than 6 months ago! I never tire of the country and the food! Yes, what is with the nightlife in Spain..these people are up all night and dinner at 10….geez….by the time I got used to it, it was time to leave. This breakfast sounds awesome! I still haven’t been to Spain and am dying to go. My favorite breakfasts were in Amsterdam – on two separate visits there. They were somewhat similar to what you’re describing here. Lovely photos! This looks great, your pictures are amazing! Te echo de menos Madrid! I read lots of food blogs about food from other countries, but I feel yours accurately captures the madrileño food scene. I grew tired of the meal you describe here because it was pretty much all I knew and I would buy bocadillos de tortilla and café solos at every café. That said, now that I am back in a small town in the States, I would give anything to eat that meal again! Thanks for the photos-it helped me to live vicariously through you all! Your spread looks fantastic! I’m curious about the “grated tomato” is it just raw tomato pureed? Marc – it’s actually grated on the “big hole” side of a box grater. You end up with only the skin in your hand. It’s a great trick and mixed with some olive oil makes an instant cold sauce – the original ketchup, I guess, but also works perfectly for pa amb tomaquet (pan con tomate). Cassidy – you’re too kind. We are extremely jealous of your long stay en Madrid. Stacey – you’re right, this would absolutely be just as good as a lunch or dinner or as a snack at any time of day or night. we’ve been having tortilla bocadillos all week and let me tell you, tortilla espanola only improves with age! Joan, N.P. – it’s a lifestyle we love in a country that is easy to love too. Bren – Chocolate con churros were eaten, hungover, in Chocolateria San Gines, as the Madrid tradition requires. Jen – I’m sure we’re not the first to say this, but if you can, you should go. It’s worth whatever money they charge you. It is. Great comments! I didn’t think this would generate much, but glad to see it has. alimama: you’re crazy. and it was a brisk (read: COLD) sunday! marc: the grated tomato is simply ripe tomato grated using the small grate until the only thing left is a bit of tomato skin in your hand. we then add a pinch of salt and a tablespoon of really good extra virgin olive oil swirled in. it’s so simple and so delicious. give it a try! I almost never get around to eating breakfast, but when I do I’m likely to have something like this. 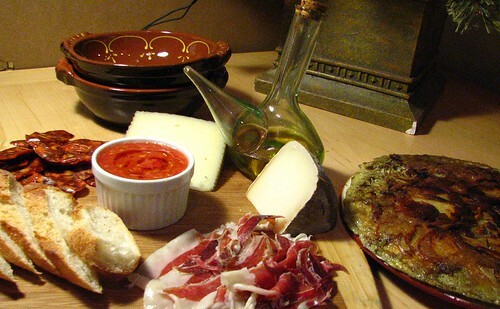 Cured meats, flavorful cheese, condiments – add a couple of olives and I’m a happy, happy girl. Also – caffeine, sugar and vast quantities of nicotine are what I do best. If you ever want an extra companion at your breakfast table…..
That plate and some red wine would please me so. As for vacation memories, I’m the same. I think it’s smells, sights, words said, a flavour or music can trigger the most miniscule detail of your trip. An authentic Spanish breakfast in Brooklyn! Bravo you guys! What a beautiful display. I miss Spain so much, i grew up in France but only 45 min from San Sebastian. We would go on week-ends for grocery shopping (and booze too 🙂 visiting the local Tapas bar along the way. Ahhh! Those were the days! I was too young to drink but my memories of the food are just like in your picture. Now THAT is my kind of breakfast. How delicious! I totally agree with you about the hotels by the way, it seems the breakfast timiings are always arranged to fit in with the staff, not the guests, which I find incredibly annoying. I often eat some sort of meat-bread-cheese combo for breakfast, as I simply cannot bear sugary cereals in the morning. Bleugh! you know what, we found some organic tomatoes that were over-ripe and were perfect. we also found using ripe grape tomatoes worked well too. i know it’s not the time for good tomatoes, but find some red, really ripe ones and you’re good to go! I’m in love with all of those meats and the cheese and the bread. I can’t believe anyone would miss a 10AM breakfast. When I’m on vacation, I’m out by 8. I’m on vaction. Too much to do, too much to see. If I ever go to Spain, you can bet I’ll be out as soon as I can be, taking it all in. Rachel – I definitely appreciate the make the most of your time while you’re there mentality, but we’re just going to have to differ on this one. Unless you intend on being utterly delirious with fatigue, I would suggest that you don’t bother getting up early in Madrid. Not only is jet-lag a problem, but nothing really opens until around ten a.m., and if you’re going to appreciate the city’s famous lifestyle, and do as the locals do, you’ll need to be awake most the night. Roommate Mario’s breakfast is timed that way for a reason. My husband and I spent our honeymoon in Spain. We loved all the food, but the breakfast at this tiny bed and breakfast we stayed at in Andalucia was out of this world. It was much as you describe here- the bread, the ham, the coffee. The family who owner the place we stayed at made a sort of salsa out of locally grown tomatoes. 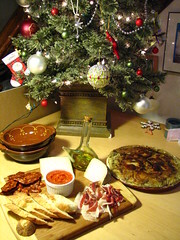 It was spread on the bread (homemade- mmm), manchego cheese was added, and then a good Spanish ham. Thanks for this post- I’m inspired to make this for my husband now! Thank you for your comment! I am really working on my photography! I was just in Malaga this last Xmas and I fell in love (all over again, as I lived in Spain for 20 years) with Spanish food–the tomato and olive oil on toast in the morning plus the incredible cafe con leche. Your pics of breakfast in Brooklyn are reminiscent of my trip and I cannot wait to get back. What is Union Market? Hi, Laura! Thanks for the comment. Union Market is a specialty store here in Brooklyn, NY. If you google “Union Market brooklyn” the website will come up. It has great meats from other countries and other tasty things that are imported. Thanks for this review. DH and I are looking for a place to stay when we visit Madrid and this looks to fit the bill!